They don't call the stretch of Route 3 that runs from Pittsburg, New Hampshire, to the Canadian border "Moose Alley" for nothing. If you're visiting New England and you want to see moose, this scenic road is certainly one of the best and most reliable options. Pittsburg (compare hotel rates and reviews) is New Hampshire's northernmost town, the final outpost for those exploring the Great North Woods. New Hampshire's northern wilderness is the preferred hangout for the majority of the Granite State's population of about 3,800 moose (as of 2016). With those statistics and Moose Alley's reputation, I suppose I can understand why my husband flew right past a roadside moose as we were en route to Moose Alley. When I squawked, he reassured me: "We'll see plenty of moose in Moose Alley." As we set out north on Route 3 from the small center of Pittsburg, large gold highway signs at regular intervals warned: "Brake for Moose. It Could Save Your Life. Hundreds of Collisions." We had no need for brakes, though, in the first few miles of our journey, and I could tell Bruce was starting to sweat a bit. I'm sure he was wondering: Which is more dangerous… a 1,200-pound moose in the road or an irate wife a tenth the size in the passenger seat? Of course, we weren't traveling through Moose Alley at the optimum time to see moose. The best times for moose sightings are early morning and dusk, and we were on the road at mid-day. Just as I was beginning to despair, we cruised over a ridge, and I could feel the seatbelt pin me in place even before Bruce yelled something like "Whoa!" A cow moose with seemingly little regard for the line of cars and the swarm of moose paparazzi licked the salty highway for a good five minutes before a car that didn't care to stop sped past and spooked her. My husband had already redeemed himself, but he went the extra mile by spotting a handsome, deep chocolate bull moose at the edge of the woods before we reached Canada. 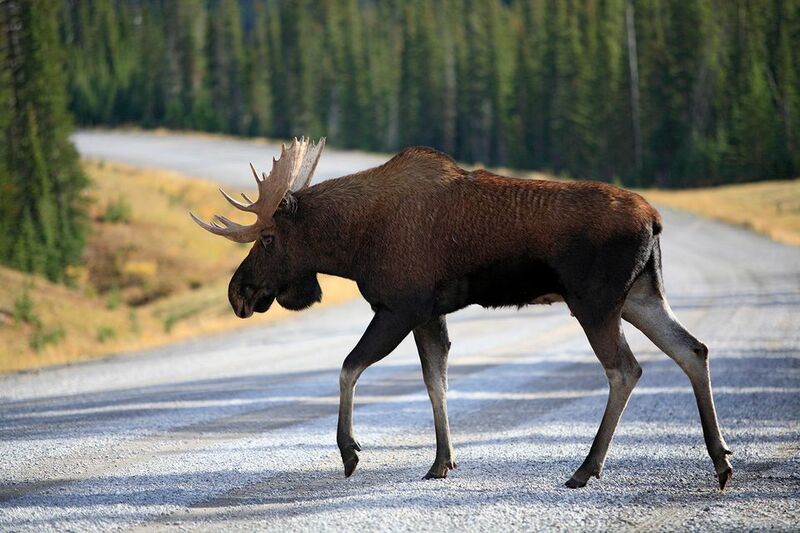 If you want to get out of the car to view and photograph a moose, be sure to pull off the road completely. Use your four-way flashers. Don't get too close to a moose. Keep your camera on, and keep the lens cap off. Or have your cell phone unlocked and ready. Moose encounters may be brief. And, keep in mind, this is a beautiful drive through wild and pristine New Hampshire and along the lakes that form the headwaters of the Connecticut River, even if you don't see a moose. If you'll be the one in the driver's seat, you may want to practice saying that line a few times before you set out so that you can utter it with conviction to your disappointed passengers if the critters don't cooperate. Planning to continue north? Here's everything you need to know about crossing the New Hampshire-Canada Border.